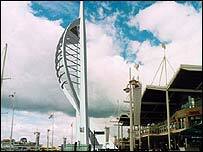 A council says it has saved money by allowing a lawyer who advised on Portsmouth's Spinnaker Tower to retire early with a payment of £85,000. Barry Smith will also receive a pension top-up of £24,000. The troubled project is now £10m over budget. A council meeting about who was to blame was inconclusive. The move ends Mr Smith's four-month suspension and avoids disciplinary action which "could have cost a quarter of a million pounds", the council said. Mark Wingham, of Portsmouth City Council, said: "By taking this action, Portsmouth City Council will save tens of thousands of pounds of tax payers' money that would have been spent through the long and torturous proceedings. "Members have exercised their discretion in agreeing a less favourable package than other departing officers to reflect Mr Smith's position. "We wish Barry Smith well for the future."